A coaching client told me that she enjoyed her morning quiet meditation and that she felt centered for a few hours. As the day proceeded she felt less calm. She wondered if she should start meditating more times during the day and was a bit stressed about how to fit it in her busy day. The value of taking a few minutes for quiet on a regular basis is to essentially practice being calm and building our skill of noticing and coming back to the centered state so we can do so in the midst of our activities. It is not uncommon to become reactive and stressed as we face the challenges of daily life. It is great to build the habit of becoming aware of our internal state and then centering. It is useful to build the habit of noticing your internal climate, naming your emotion and then shifting to become calm. There are many ways to build this habit. You can notice your feet and feel grounded as you transition from one activity to the next and then calm yourself for the next meeting or interaction. You can also focus on what you are grateful for as you hear the phone ring or stop for a light when driving. You can give yourself reminders such as a tone on your phone or a note to yourself to remind you to reset and experience ease and calm on the go. You can also use moments of irritation as reminders to shift to being open. These small shifts support you in building the habit of experiencing ease and openness. Notice how with practice the mindful process becomes automatic. 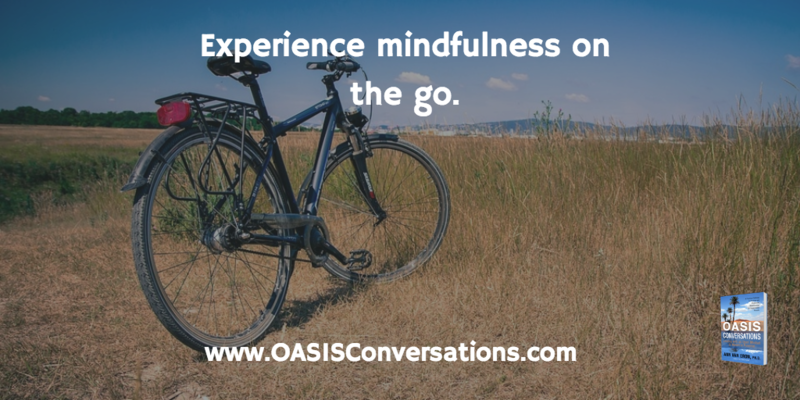 This entry was posted in Mindfulness by Ann Van Eron. Bookmark the permalink.